Portland, Oregon has served as home to MusicfestNW for 15 years and Project Pabst for the last two. Now, for 2016, the two festivals have merged to become MusicfestNW Presents Project Pabst. The new super festival will take place August 27th and 28th at Tom McCall Waterfront Park. Tame Impala, Ween, and Duran Duran top the inaugural bill. Other notable acts include Ice Cube, Drive Like Jehu, Nathaniel Rateliff & The Night Sweats, Unknown Mortal Orchestra, Parquet Courts, ASAP Ferg, Sheer Mag, Andrew W.K., Hop Along, Diarrhea Planet, The Coathangers, and more. In addition to the two-day festival, MusicfestNW Presents Project Pabst will also present a series of music and comedy shows in various Portland venues between August 25th and 28th. Tickets for the festival are on sale now, with early bird pricing set at $45 for day passes and $75 for the weekend. After the early bird tickets sell out, prices will increase to $55 and $90, respectively. 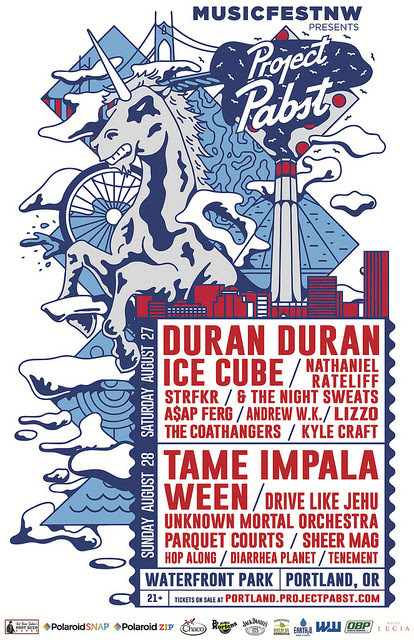 Pabst Project also recently announced the lineup for its Denver festival. Set for May 20th – 22nd, the lineup includes Built to Spill, Nathaniel Rateliff & The Night Sweats, Courtney Barnett, Violent Femmes, The Giraffes, Doomtree, Dead Meadow, and more. Further Pabst Project festivals are planned for Atlanta and Philadelphia in 2016.